How good is your phone when it comes to gaming? There are a few ways to find out, but 3DMark is probably the best. That's the only benchmarking it does, after all. The app has been pretty clunky for a while, but it just got a major update with a cleaner UI, more tests, new charts, and a ton more. Here's the changelog for 3DMark v2.0. Completely redesigned app is now faster and more useful than ever. New charts, lists, and cards help you learn more about your device. See how your scores and device compare with the latest models. New Sling Shot Extreme benchmark test using the Vulkan API. New Material Design UI is fast, responsive, and easy to use. See the updated app description for more details. The updated version of the app now follows the material guidelines more closely. You've got a bottom bar for access to all the parts of the app, and everything is much more fluid. 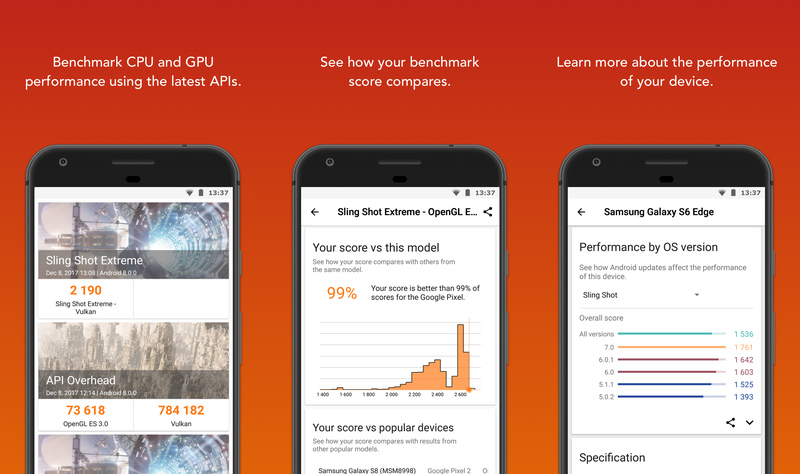 For devices with support, you can get a version of the Slingshot Extreme test with the Vulkan API. This will give you a better idea how your phone handles games that use that API. The preview images of the tests also have a neat parallax effect when you tilt your phone. Be aware, Vulkan performance might seem bad, but that's a function of drivers on your phone. Some of them still have a long way to go. You can give it a shot right now—3DMark is free.